From the bridge, there’s a pretty view across the meadow to Plas Llan (or Plas yn Llan), the white house with tall chimneys. There’s no public access to the house, which is best viewed from the road here. Inside the house are roof beams that bear carpenters’ marks from the 15th century. The house was improved by Sir John Wynne of Gwydir, whose coat of arms with the date 1684 still adorns walls inside. There’s also an impressive oak door bolt which secures the heavily studded front door. 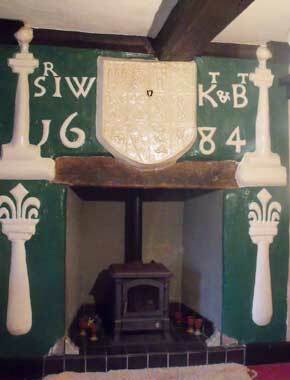 A similar example can be seen in Plas Mawr, Conwy. The Great Barn (which you can see to the left of the house) has 63 nesting holes built into one of the walls, presumably to raise pigeons for the table. Flowing beneath the bridge is Afon Hiraethlyn, sometimes Erethlyn in old documents. From here, the river eventually reaches the National Trust’s Bodnant Garden, where it falls dramatically down the waterfall into the Dell. Look carefully at the coping stones of the bridge to see how, over the years, children and young people have tried to immortalise themselves by etching their names or initials into the slate. In the mid-19th century, a Mormon called Hugh Roberts was threatened with hanging at the bridge. He and his wife Mary kept a shoemakers’ shop in the village. They became Mormons in 1847 and helped form a new Mormon Church branch in Eglwysbach, to the disgust of neighbours. Their trade dwindled and eventually they emigrated to become significant figures in Mormonism in the USA.